How to tie "mop" style jig skirts? 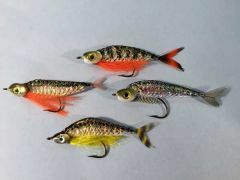 I am wondering if anyone has any resources showing how to tie mop style jig skirts onto football head and flipping style jigs. I am just getting into tying my own jigs and would like to learn the proper way to do it. I intend on using living rubber for the skirt material. Any help would be appreciated! Here you go guys. This is what fly tying is all about. Here's an idea I came up with after inheriting my Grandma's old wooden bread box. It looked like a miniature fly tying desk, so I decided to make it into one. It was so easy to make, that I decided to go on Craigslist and find another one real cheap. Anyone can do this...... I made a video on how to make one, and put it on you tube. 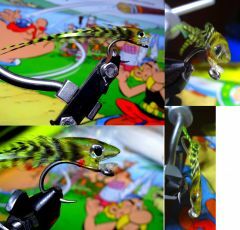 If you like it, send the link to your fly tying friends. The store-bought ones are CRAZY EXPENSIVE... this one I think is classier, and of course easy on the pocket book.